In a world of crime and punishment, of law and justice, it’s usually pretty clear that we want to be the good guys, except when we also want to look great and own the whole town! It’s rough and, frankly, pretty gross to be rolling around in the dirt and muck trying to solve crimes when, instead, you could participate in bolstering the economy and proving to the family just how much they matter! Who could blame someone for looking after important things like that!? So, ultimately, it is up to you… which kind of Mob boss will you be? It is a pretty easy choice to be the hard, but firm, loving but stern Don or Dona, but the real choice is making sure how you’re going to look the part! Choosing the right kind of clothes to participate in high society is crucial, but you better not overlook your feet. After all, when you get those visitors who want to kneel down and kiss your ring, you want them to be looking at upper class style, even at the bottom of your feet. 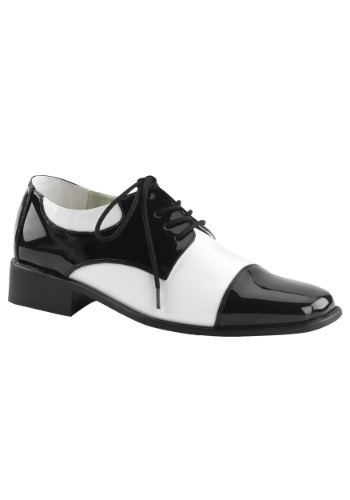 You can do so pretty easily with these Deluxe Gangster Shoes. These classic black and white wingtip Oxford clackers have black rubber, non-slip soles, and a comfy lining that will have you looking sharp and help avoid slipping on any unsavory spills as you get to your getaway vehicle. Join these with the full Gangster regalia and you’ll be having other Gang Bosses coming to ask you for favors! Fit my husband well and he loves them!! We bought them for a Great Gatsby themed Christmas party and they were the perfect finishing touch!